The rains have come; the dry summer season has ended. The other day we had 1.1 inches of rain, the most for any day this year. And it looks like it's going to be a rather boggy week, with rain or showers expected every day. It's when the weather becomes like this, and the terms "Oregon Mist" and "Liquid Sunshine" and "sun breaks" are used to describe our daily experience, that people start saying things like "and you grow cacti?" Ah yes, even during the grayest days of midwinter. Even more-so then than in the brightest days of summer. We have a new cafe in our neighborhood. They've been open for about a month and had their "Grand Opening" event yesterday. It was a great event. And all I can say is that this is what American capitalism is really all about: people pursuing their dream and striving to make a decent living doing so. I don't think Ali and Evan have any expectations of becoming millionaires with this venture, but they will make a decent living and do something good for the community at the same time. (Click on the title for a link to their blog and prepare to salivate!) Our best wishes to them. We can have a democracy or we can have great wealth concentrated in the hands of the few. We cannot have both. To insecticide or Not to insecticide, that is the question. Actually, it's not much of a question at all...at least, not with a large collection of plants such as we have. Growing so many different genera and species of plants in such a relatively small space isn't natural in and of itself. As a result, in our situation, it's pretty much a necessity to use insecticides in order to have a healthy population of plants. It's not a job I enjoy, but somebody's got to do it. The key is what to use and how to use it effectively so as to not have to do it more often than necessary. And to do it safely. We use a systemic in order to have a longer term effect without having a long term residual presence on the plants or in the soil. What are the primary beasties we're after? The usual culprits: Mealy bugs, scale (though we almost never encounter these), red spider mite and fungus gnats (an occasional nuisance). Good cultural practices (adequate air circulation and proper watering for example) can reduce the incidence of these pests, and botanical and certain household remedies will often be adequate with small collections. But we outgrew that point a long time ago! Soooo, if you don't see or hear me for a while, I'm that guy with the mask and gloves and long sleeves and a big sprayer pack on his back. Our expertise over the years has not focused on cold-hardy succulents (other than semps and sedums). The exceptions have mostly been the result of accidents. Take Echinocereus viridiflorus, the green-flowered hedgehog. For years we've grown plants whose parents grew in Northern Colorado, almost into Wyoming, at a fairly high elevation which gets exceedingly cold during the Winter. But it wasn't until last winter that we found out how well they can do, even in our wet-cool winter climate. Sometime early in the winter, something - we assume a cat - knocked them out onto the outside ground where the remained bare-root through the snow and rain. They survived quite well thank you. But, please note! They did have excellent drainage! As I got up this morning it was in the 40's (F) outside. Brewed a cup of coffee, bundled up a bit, let Osita (our dog) have a run, fed "Lady Bug" (our miniature horse), and sat on the deck for a bit. And then we begin "bundling up" the greenhouses and "stuffing" the plants therein. Oh, for more room! The question this year - as always - which plants do we dare leave out, with protection from the rain, and which ones dare we take the total risk with, letting them get both Oregon rain and cold temps. If you live in the Portland area, you can help us out though. We're going to be selling plants at the Fall Home & Garden Show during the weekend of October 4, 5, 6 and 7 at the Portland Expo Center. Every plant you buy means more room in our greenhouses!!! This is our first attempt at blogging, so here goes. 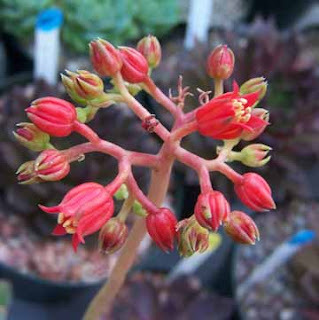 Our purpose is to provide a forum for discussions regarding the cultivation of and information about succulent plants. It also allows us to share with you as soon as it occurs, new additions to our nursery catalog.